Triangular Hamper Stand is available in two options--standard and stainless steel. Both medical hamper stands come with 1-inch tubular construction. The standard model has a powder coating finish. Designed as a hospital linen hamper, this hospital laundry hamper is useful for clinical care, nursing home applications and homecare. Two support legs are adjustable in height to reach the optimal position to prevent the lid from hitting walls. These rear support legs offer stabilization by providing 2 additional points of contact with the floor for a total of 5 points of contact. Three caster wheels allow for easy transitions from room to room. A lid damper on both models allows for easy opening and quiet closure. A dual access foot pedal activates the hamper lid, making it easy to access from either side of the hamper stand. R&B Wire products are manufactured in the USA for increased reliability. 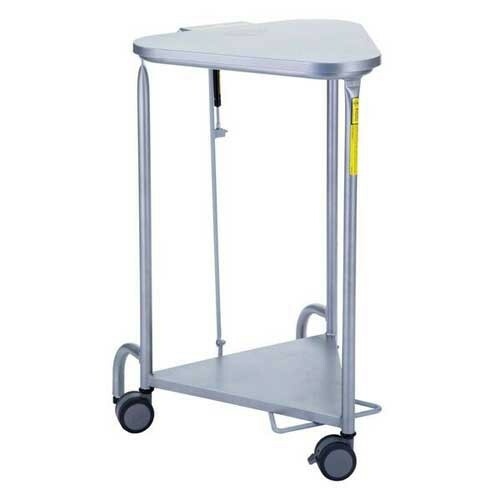 Vitality Medical carries many R&B Wire products including the Bulk Transport Truck, Economy Laundry Hamper Stand, Hospital Laundry Carts, and Hospital Privacy Screens. R&B Wire hamper on wheels. Convenient access from either side of the medical hamper stand to the dual access foot pedal. Stainless steel option with stainless steel lid damper allows for easy opening and a quiet smooth controlled closure. 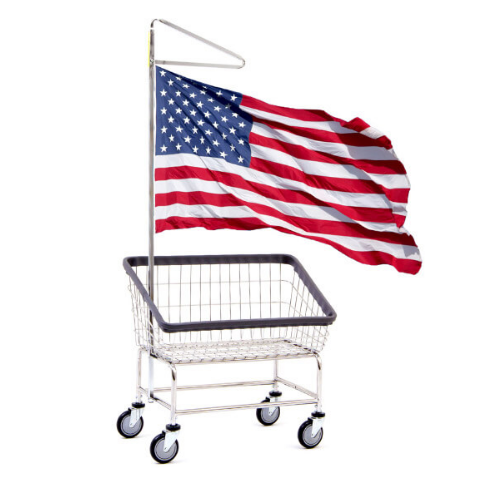 1 inch steel hamper stand option or steel with powder coating. 4 inch non-marking quiet-ride casters ensure smooth quiet rolling (one locking caster). Material: 1 inch tubular steel with powder coating. Three caster wheels, one locking caster. Width: 21 Inch (front to back).